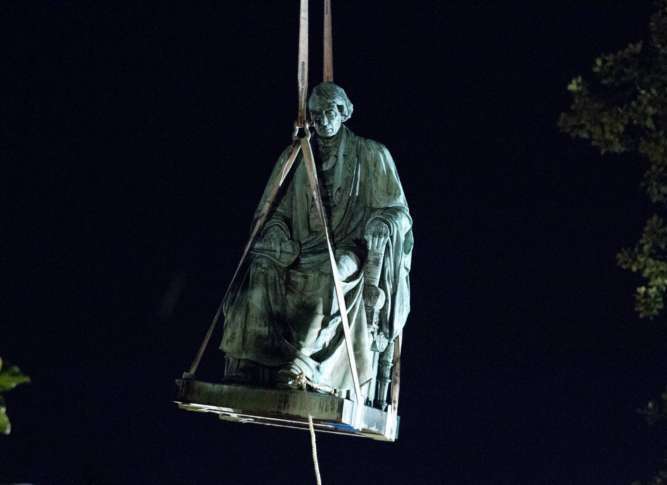 WASHINGTON — The controversial statue of former Supreme Court Chief Justice Roger B. Taney was removed from outside the Maryland State House in Annapolis early Friday. Shortly after midnight Friday, a crew using a crane came in and started taking the statue down. It was lifted up on a truck and driven away. The whole process took less than two hours. It was done with little fanfare or warning, while Gov. Larry Hogan, who supported the statue’s removal, is said to be out of town. Hogan had called for the immediate removal of the statue earlier in the week following the protests that turned deadly in Charlottesville, Virginia, last weekend. “While we cannot hide from our history — nor should we — the time has come to make clear the difference between properly acknowledging our past and glorifying the darkest chapters of our history,” Hogan said in a statement Tuesday. The vote to remove the Taney statue came Wednesday from the State House Trust board. The decision didn’t sit well with Thomas V. Mike Miller Jr., president of the Maryland Senate and a member of the State House Trust Board, which Hogan chairs. The vote was taken by email, which is not unusual – WBAL reports that the four-member board has only met twice since 2010. But Miller said in a letter to Hogan that he requested a public meeting on the removal of the Taney statue. Taney, a Maryland native, is best known as the chief justice who penned the 1857 Dred Scott decision. It denied citizenship to black slaves and descendants of slaves, that slavery couldn’t be banned in new territories of the United States, and that “the enslaved African race were not intended to be included” in the words “all men are created equal” in the Declaration of Independence. On Friday morning, sticking up from the bushes where the statue used to be was a green box roughly 10 by 15 by 10 feet, containing the base. Throughout the morning, people made it a point to stop by and look at the box, taking pictures and staring at what was left of the longtime statue. Many people were happy the statue is gone, but others lamented one more piece of history taken away. The statue of Taney will be moved to a Maryland State Archives secure storage facility, The Baltimore Sun reported. It’s unclear what might end up in the spot where the base of the statue still sits. 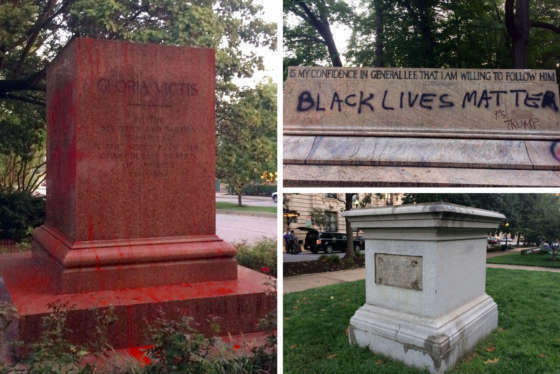 By the time the sun came up Wednesday, all four of Baltimore’s controversial statues were gone, and some of the sites were covered in spray paint and other graffiti.